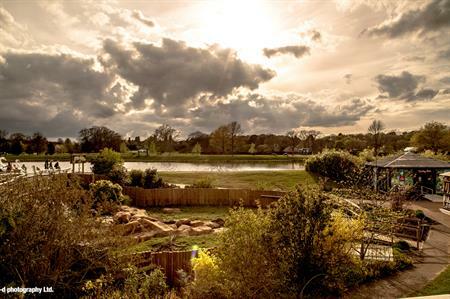 Costa Coffee took 60 employees to The Safari Lodge at Woburn Safari Park in Bedfordshire for a human resources conference. Taking place in April this year, the retail coffee chain wanted to create an event that focussed on leadership and development in a unique environment. Delegates included 60 members of Costa’s HR team from the head office in Dunstable. The event included a special talk from guest speaker and leadership expert Penny Ferguson, who was there to provide thought-provoking personal stories, questions and discussions. Following a recent renovation, the Safari Lodge at Woburn Safari Park now has a conference and meetings space with new décor, modernised A/V equipment and a newly extended decked veranda. The Lodge was selected by Costa because of the flexibility of the Park’s team and the adaptability of the venue, which was split into two sections to create a breakout area. Woburn Safari Park’s corporate events team provided a buffet lunch for the Costa team, overlooking Swan Lake and the Desert Springs meerkat enclosure. Guests also had the opportunity to spend time with the animals in the Foot Safari and take boats out on Swan Lake after the conference. Charlotte King, HR Advisor at Costa, said: "This event was all about leadership and wellbeing in the workplace, so we were keen to find a large venue that had a positive ambience to encourage confidence and participation. The Safari Lodge fitted the bill perfectly. It is conveniently located near our head office and the large, animal-inspired space amid the enclosures of the Foot Safari offered the opportunity to really run with the ‘wild’ theme, which included jungle music over the new audio system." She added that feedback from the staff was also great, and that the company was in talks with the park about holding future events at the Safari Lodge.